Canadian Billy Bishop, greatest ace of the British Empire with 72 victories. He was also the author of Winged Warfare in World War I.
Canadian born, the gallant Colonel Bishop is the ranking British ace with seventy-two victories. 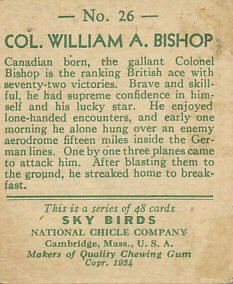 Brave and skillful, he had supreme confidence in himself and his lucky star. He enjoyed lone-handed encounters, and early one morning he alone hung over an enemy aerodrome fifteen miles inside the German lines. One by one three planes came to attack him. After blasting them to the ground, he streaked home to breakfast. 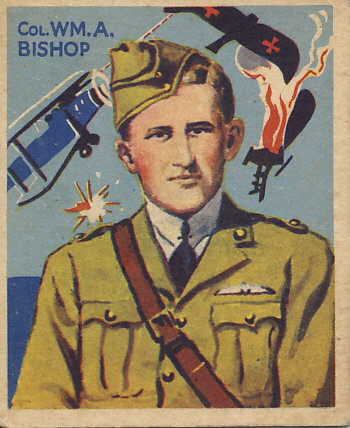 The greatest Canadian ace and leading ace of the British Empire, Billy Bishop had 72 victories.